Houseflies can transmit intestinal worms, or their eggs, and are potential vectors of diseases such as dysentery, gastroenteritis, typhoid, cholera and tuberculosis. They will frequent and feed indiscriminately on any liquefiable solid food, which may equally be moist, putrefying material or food stored for human consumption. Flies liquefy food by regurgitating digestive juices and their stomach contents on to the food substance. This ‘liquid’ is then drawn up by the suctorial mouthparts and in doing so the insects pick up pathogenic organisms, which may collect on their bodies to be transferred on contact with other surfaces or survive passage through the gut to be deposited as fly spots. 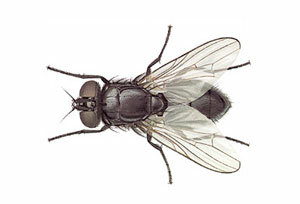 Fly spotting, produced when the insect feeds or defecates, results in rejections of contaminated farm produce, for example eggs, at point of sale. Furthermore, flies are frequently the subject of complaints to environmental health authorities, causing major problems where infestations over-spill from breeding sites such as rubbish tips and animal houses. The Lesser Housefly makes longer flights and spends less time resting than the Common Housefly. Females of the species tend to remain near the breeding sites and only the males migrate. For these reasons F. canicularis is less prone to transmit disease than M. domestica, but large populations and similar feeding habits mean that this insect, too, has a considerable potential to act as a vector of disease. It has occasionally been implicated in intestinal or urinary myiasis. Flies have rapid, prolific breeding habits and high mobility. In order to break the lifecycle, control measures should be directed against larval and adult flies. Satisfactory hygiene is necessary to limit potential breeding sites and food sources. Domestic refuse: this must be stored in well sealed bins, for early removal to disposal sites. High-risk material should be sealed in bags and burnt wherever possible. Refuse tips should be covered with earth, to a depth of at least 230mm (9 inches), and then compacted. This will minimise adult emergence and promote fermentation temperatures at which larvae cannot survive. Farm manure: manure should be kept as dry as possible, especially in poultry houses, where leaking water feeders can provide ideal, moist breeding conditions. The Biothermic method of storing dung involves compacting manure into a cuboid stack, a method particularly suited to horse manure. This form of storage promotes uniform, persistent fermentation throughout the dung, which is lethal to larvae. Tarpaulins can also be used to cover heaps, in order to prevent egg laying and conserve the heat of fermentation. Entry of adult flies into buildings can be prevented by 1.18mm-mesh fly-screens (which can easily be removed for cleaning), air curtains, bead screens or self-closing doors equipped with rubber flaps. Maggot traps take advantage of the fact that larvae need to migrate from breeding sites to cooler surroundings in order to pupate. A simple trap consists of a concrete platform, on which manure or refuse is stored, surrounded by a water-filled moat in which migrating larvae are trapped. In order to obtain the best results, insecticidal control measures should be integrated with good hygiene.